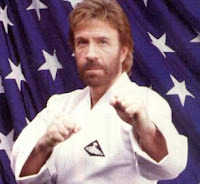 I used to have a gi with the American flag sewn on the sleeve. The caption read Martial Arts - USA as if this were some new paradigm. Maybe it is. Somewhere along the line the martial arts became a bona fide American institution, like baseball, apple pie and labor unions. But do American budoka measure up to their Asian originators? Has the US or anywhere in the West produced the likes of a Kano, Funakoshi or Shimabuku? Donn Draeger, who studied for many years under Japanese sensei, felt that for a classical martial system to be preserved justly, it must include the manners, customs and beliefs indigenous to that style's nation of origin. So then what aspects of American culture influence our interpretation of the martial arts? Are we doing them any justice? Draeger had doubts about this, defining The American Way as ultimately "lazily convenient." We like to think we all train hard. And we're accustomed to the formal etiquette practiced in nearly all dojos, especially the all-important aspect of rei (respect). Respect is apparently lacking in our culture, certainly more now than in the past. One only has to witness the disrespect that is present in the workplace and public schools. Notice how religion and nationalism come into play in the second one. Should these icons be included within the context of martial arts training? When Okinawan karate first arrived in Japan around 1920 it became infused with Japanese ideologies, which included militarism, Zen, and yamato damashii - the "Japanese spirit". Some Okinawans were unhappy with these changes, but karate's move to mainland Japan was but a prelude to its worldwide acceptance and popularity. Equally, when the martial arts arrived here in the US they became Americanized to a degree. Did this necessarily devalue them? I don't believe so. If you're a sincere, committed student in the right school then coming to terms with these cultural infusions can be transcended, if they matter at all. But do American budoka measure up to their Asian originators? Do the Japanese? I often question this. To my mind, it seems like the older koryu were synthesized by the likes of Kano, Ueshiba, and Funakoshi into newer arts better suited--they thought--to producing people of good character, good Japanese citizens. But in other respects? I have often thought of what Thomas Makiyama, an American of Japanese descent who has lived in Japan and taught Aikido there for decades now, wrote in his Keijutsukai Aikido:"Japanese students, as a rule, do not ask pointed questions, and are content to do as they are told." You could make a case for such people being good Japanese citizens, I suppose, but the sort of innovation that produced the very arts they are practicing seems scarce. Can they? I am quite certain that the United States has people every bit as technically proficient, but we are talking more than technical proficiency in the case of these two men. We are talking about people who could sell a curriculum of fighting techniques to a culture as a means of character development. Being able to do that says something about the culture as well as the men. I'm not sure that the United States is really geared toward developing character by that particular means. In a whole different class, I think. From what I understand, his system is far more popular outside Okinawa than inside, and is largely associated with Americans, especially Marines. Far from Funakoshi's "The ultimate aim of karate-do lies not in victory or defeat, but the perfection of character of its participants," Shimabuku's Isshin-Ryu seems terrifically concerned with victory. I don't think the Marines would have given it a second look if it hadn't been. Now, they've spread that system throughout the world and its emphasis on practical application seems very suited to the American mentality. To the making of good Japanese citizens? Not so much! Americans ask questions; they want to know why, and many of them won't hesitate to make changes to make what they are doing better suited to their environment. In this, I think, many Americans are more like Kano and Funakoshi than are many Japanese. I really like your concept that as North Americans "We like to think we all train hard." But how truthful are we being with ourselves? Is that one, or two hours of training done twice, or three times a week really equal to the amount of training that the Art of Karate demands? In all honesty, I have to consider myself as not meeting the fullness of karate training regardless to how much time I dedicate towards my Art. Life still interrupts. To survive in this world I need to work and make money, do housework, buy groceries, spend time with my family and friends. How can America produce a Kano, Mas Oyama, or Funakoshi when a person's energy has to be divided in so many directions? The only answer that I could find is if a person could devote themselves to training in their Art for an intense amount of years.. similar to the Uchi Deshi system that is available in Japan. Would a modern North American Martial Artist be willing to devote 7 to 10 years of their life to daily 8 to 10 hour hard training sessions seven days out of seven during their prime? Or am I not understanding the demands of the Uchi Deshi training? Good post John and excellent reply's Dan and supergroup7. We can go on for a long time with this thread and still have room for more discussion. I feel that karate, about 90%, in our country has gone completely sport. I feel 90% has taken the easy road by only practicing what they enjoy or what gives them a feeling of power and superiority. I feel we have lost a great deal that the martial arts can offer by Americanizing the martial arts. I would no longer call what we practice here as a martial art giving what martial means and art as well. We train people to win trophies and get ego enhancement. Then again, I am in one of those moods of disappointment with how I see things in today's UFC world where the strictly combative nature of competition has ruled. I use the term combative loosely. I do feel we have a very small percent of Americans who strive for the benefits of a full martial art way and hope that when the time arrives we do not lost it with the loss of those who practice it. I hope it weathers the storm of change so it doesn't become diluted. Sorry, off the soap box. In my heart, I preserve my american mind. In my heart, I preserve respect for human beings. In my heart, I adhere to my moral code. In my heart, I follow a code and certain moral values being put forward by a martial art I study. In my heart are also love,respect, work ethics and strength. And from my heart flows my karate. And in such ways the art evolves and will continue to evolve. It is up to everyone, to every practicionner and teacher to return karate to do his/her own best. When I close my eyes, I know I'm doing my best and it's all that matters. Maybe the Japanese' inability to grasp the essence of budo is generational, but also the influence of Western culture. Japan has been the world's great emulators of other cultures. First industrialism, then karate, baseball, monster flicks, technology, etc. In certain aspects the Japanese have become more Western than us. How can America produce a Kano, Mas Oyama, or Funakoshi when a person's energy has to be divided in so many directions? Some of the Okinawan masters - Kyan, Miyagi and others were born to royalty, i.e. they didn't have to work, at least not in the conventional sense. So they got to do their karate full-time. Personally I don't mind being divided in different directions, it keeps things interesting! On the whole you may be right. I think it depends on where you train. But there are probably very few schools that teach either the authentic jutsu or do aspects of the martial arts, especially the latter. It is up to everyone, to every practitioner and teacher to return karate to do his/her own best. We have a dojo training oath which mentions nothing about religion or country. It's all centered around self respect, respect for others, etc. I had to laugh about the "we all think we train hard." When you read Hayes' book, you'll see what his training was like while in Okinawa. When you read Hayes' book, you'll see what his training was like while in Okinawa. I often wonder what it must've been like to train in a traditional Okinawan dojo back in those days. I got to see if Hayes' newest printing is out yet, thanks for reminding me.